PolyMax products from Polypipe are the perfect plumbers’ mates when it comes to speed of fitting, reliability and aesthetics. And to promote the range, Polypipe have always engaged the services of Max – the excitable Plumber from Hartlepool. This brief is no different – except the proposition is slightly different insofar as the main driver to increase sales will be a substantial competition with the mention of the benefits of PolyMax products, secondary to the campaign. The creative concepts were originally based on thrill-seeking activities, and a Grand Prize of an all-expenses-paid American road trip on Route 66. The premise being that you can get the job done fast with PolyMax, enabling you to enjoy life to the Max. However, in true cinematic style, we agreed Max on the road trip would be more in-keeping with the intrepid plumber’s escapades and so simply positioned him in a blue Ford Mustang on Route 66 with a car-full of PolyMax products to boot. It’s a simple strategy, and one which is designed to sell more PolyMax products, create more brand awareness whilst helping Merchants benefit from higher footfall, more sales and increased profits. To ensure full exposure was achieved, in-branch posters, point of sale, shelf wobblers and tickets and Merchant Implementation Guide were created to complement the Landing page and an action-packed video showing Max sky-diving from a plane and landing in the Mustang. 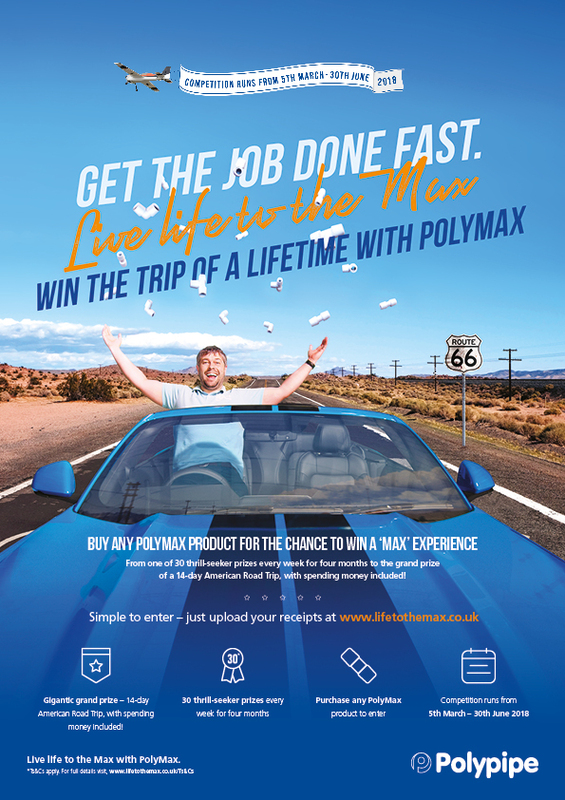 During the four months of the Route 66 promotion, PolyMax enjoyed an increase in awareness and traffic through Merchant retailers, with installers’ requests for PolyMax higher than previous years.